As an optical retailer, you are always seeking ways in which you can engage with your existing and potential customers with the objective of them being loyal and regular buyers. Remotely managed and controlled digital signage in optical retail is a must for every Eye Care Professional to have. It delivers the client’s experience that connects the online and on-mobile marketing to the physical in-store experience. 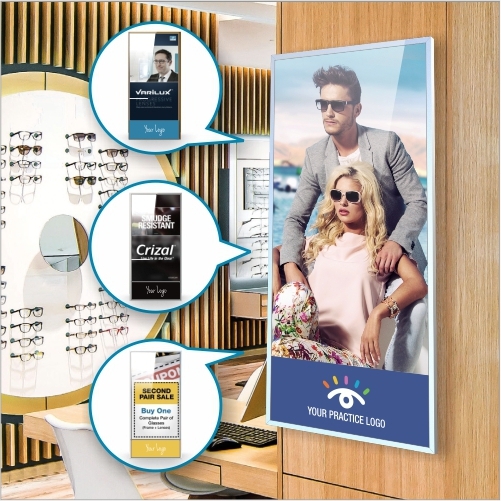 Optical retailers are using sophisticated Wi-Fi enabled digital screens in conjunction with easy-to-use mobile apps to deliver an amazing customer experience unmatched by any other media. Communicate your specials, hours, brands, products, services and competitive edge in the most effective way possible and see instant results. Create your own content or let us do it for you.